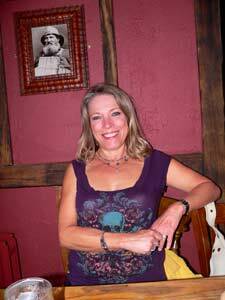 There is something special about an English (or Scottish, Welsh or Irish) Pub. 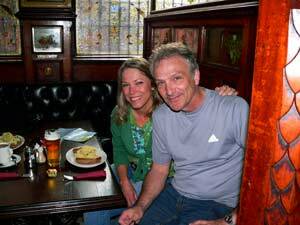 You can visit an “English style” pub anywhere in the U.S. and I guarantee it will not be the same. There is just something unique about the atmosphere in a true English pub that you simply cannot replicate on this side of the pond. 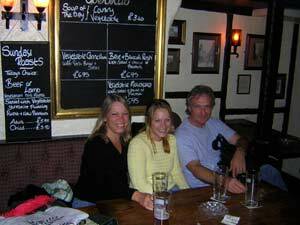 Or perhaps it’s the clientele – in any event, we’ve visited many, many UK pubs on our travels and the following are a few favorites. The Crown Liquor Saloon in Belfast is absolutely beautiful - gaslit, with a spectacular copper ceiling, stained glass windows and wonderful little "snugs" for privacy. We had what are surely the best champs potatoes in the world here and the friendly waitress gave us extra when she heard how far we'd come to enjoy them! 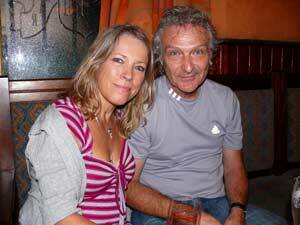 Allan and I stayed at the Bushmills Inn in Antrim County Northern Ireland for a long weekend. What a fabulous place! 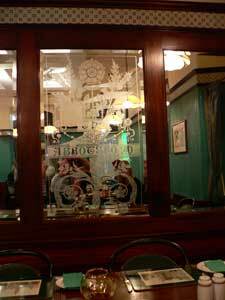 The Inn's bar is gaslit and there are lots of little side rooms off the bar with cozy peat fires. Bushmills Inn is just a five minute drive from the Giant's Causway, where we spent a great day exploring. 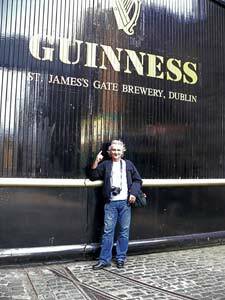 The Guinness Storehouse is fairly new to Dublin and is located at the original Guinness Brewery at St. James Gate. 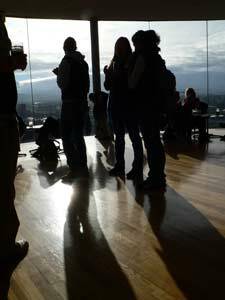 The top floor, called the Gravity Bar is a great place to have a "free" (included in the admission) pint while enjoying 360 degree view of Dublin. We were lucky enough to be there on a gorgeous, sunny October day. 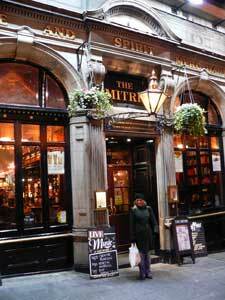 The Mitre in Edinburgh is another one of our favorites! 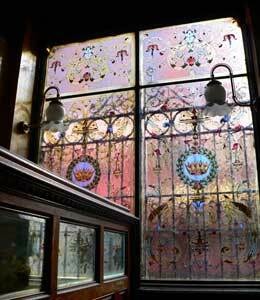 It's located on the Royal Mile in Old Town, a block or so from Edinburgh Castle and has a wonderful copper ceiling. Lots of atmosphere in this pub! 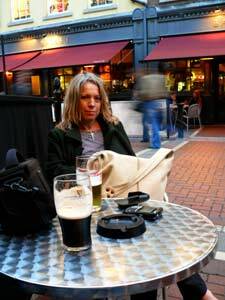 Me sitting outside of Davy Byrnes Pub in Dublin, where James Joyce was a frequent visitor and I understand he wrote parts of Ulysses here. 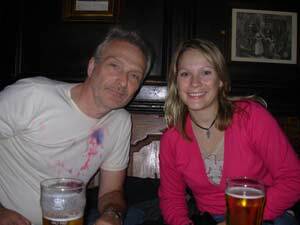 Another favorite Edinburgh pub is The Abbotsford, on Rose Street in New Town . 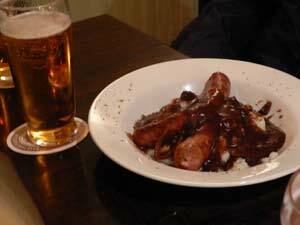 Delicious mustard mash with our bangers!! 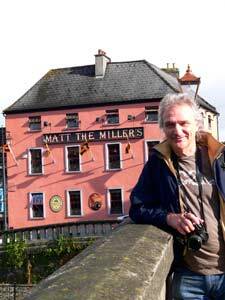 This is Matt the Millers, where we stopped for lunch in Kilkenny, Ireland to break up our drive between Arklow and Waterford. 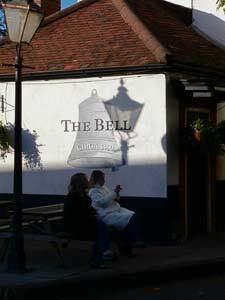 The Bell in East Molesey was built in 1460, which is 55 years before Hampton Court Palace, just down the road, was even begun. 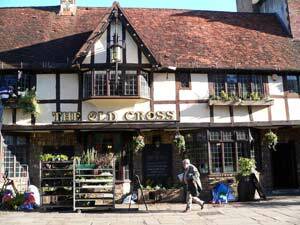 We were first taken here for a pint by Patrick, who is on Hampton Court's custody staff. Patrick has become a good friend to our family during our many years of staying at the palace. 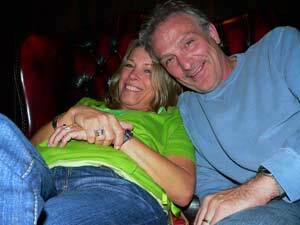 This is a place that Holly and I had wanted to visit for years and years, which is why we look so happy to be here! 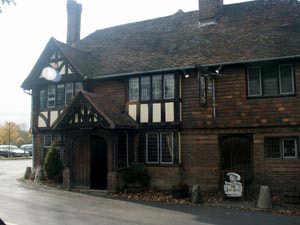 The Spread Eagle Inn in Midhurst, Sussex, is a location in one of our favorite books - Green Darkness by Anya Seton. 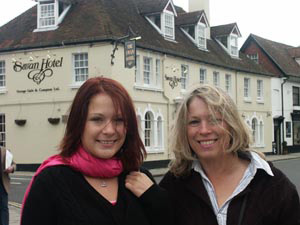 This pub is around the corner from Hampton Court Palace and truthfully was not one of our favorites. Maybe we caught it on a bad night. 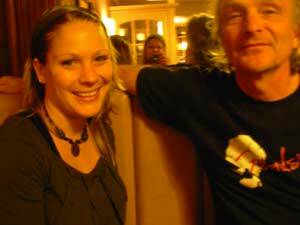 Allan and Holly at the Albion, East Molesey. 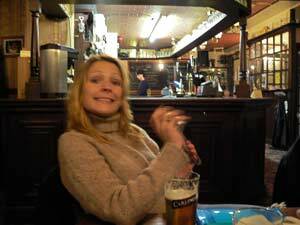 Holly at the White Lion in Chepstow, Wales, enjoying a pint of Carling! The Bertie Arms in Uffington, Lincolnshire. 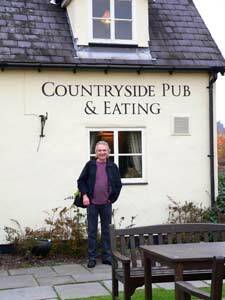 We had lunch here with Patrick after touring Burghley House in Stamford. Very nice Ploughman's Lunch and check out that thatched roof! 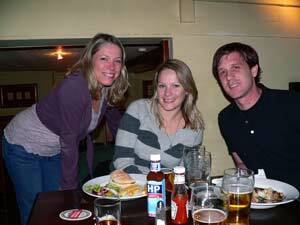 Allan and I spent three nights at the Blarney Castle Hotel in Ireland which is famous for its bar called Johnnies, where all the locals seem to come to watch soccer matches. We had a really nice time here. The entrance to beautiful Blarney Castle is just the other side of the village green. 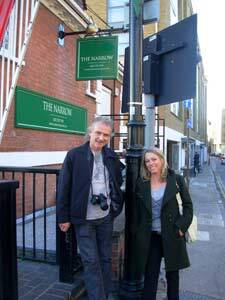 Allan, Holly and I had lunch at Gordon Ramsay The Narrow in London Docklands on our 2007 trip. The food was as fabulous as you would expect at a Gordon Ramsay restaurant, and surprisingly affordable. The only downside was some construction still going on. 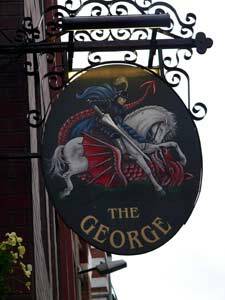 This is the George in Borough on the Southbank of the Thames. 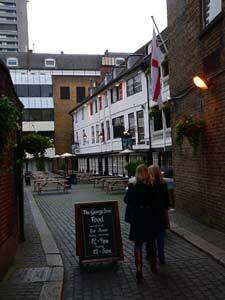 It's London's only surviving example of a galleried coaching inn. 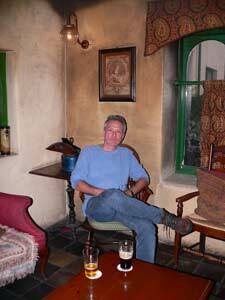 It's a great place to enjoy a pint - lots of little atmospheric rooms to choose from. 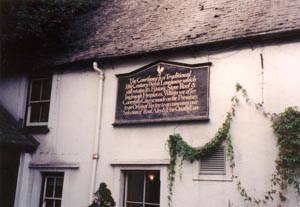 Allan and I spent three nights in Exeter and ate dinner every night at The Barn Owl next to our hotel. 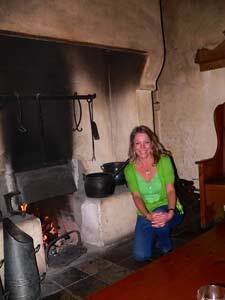 It's filled with numerous cozy fires, lots of nooks and crannies and a very friendly and helpful staff. 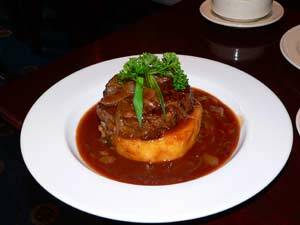 Yummy Boxty burger at the Woodenbridge Hotel, Vale of Avoca, Arklow, Ireland, and Bangers and Mash at the Prince of Wales, East Molesey. 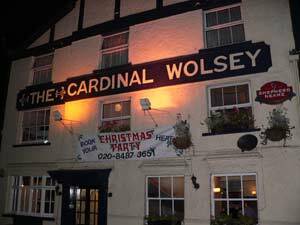 The Prince of Wales in East Molesey (along with the Albion) become our "locals" when we stay at Hampton Court Palace. It's just a short walk across the bridge to get back to our flat in the palace and the food in both of these pubs is more than decent. 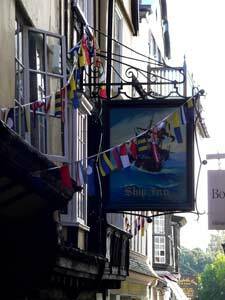 On an afternoon in Exeter we had a really great lunch at the Ship Inn, which is just around the corner from Exeter Cathedral. 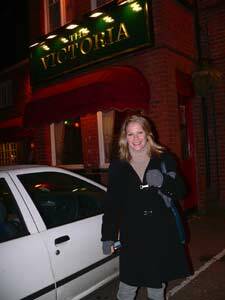 Holly wanted to visit The Victoria in Oxshott, Surrey, where her friend, Natalie, used to be taken by her Dad for peanuts as a little girl. 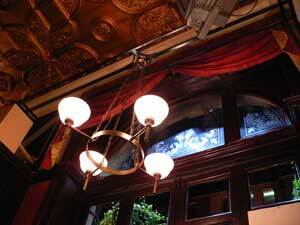 We had a nice lunch one afternoon in the upstairs room at the Crown and Anchor, Covent Garden. 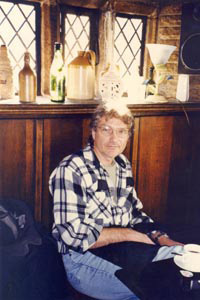 Patrick drove us to Chichester via Midhurst in 2005 and we enjoyed lunch at the Old Cross on the High Street in Chichester after touring the cathedral. 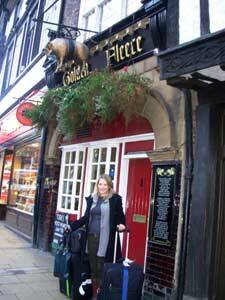 Here we are at the Golden Fleece in York. 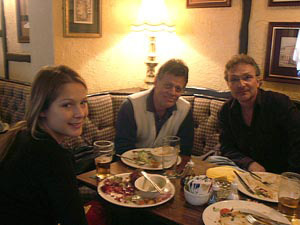 We've made many many trips to York over the years and this very old and reputedly very haunted pub has become a true favorite of ours. 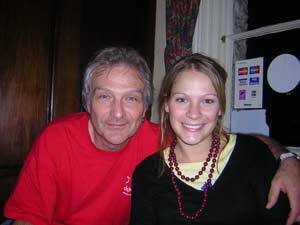 Holly and Paul actually stayed in one of their rooms on their 2006 trip, enabling them to also enjoy breakfast in the pub! 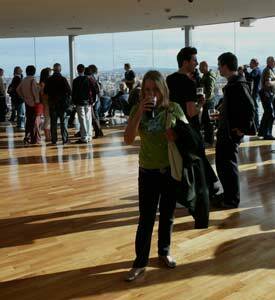 The floors are so slanted with age it's hard to keep your pint from spilling. This place is truly authentic. 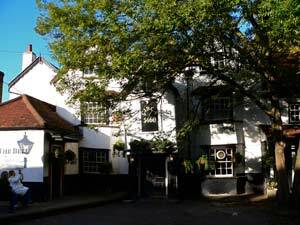 This old coaching inn has been around since at least the early 1500’s. 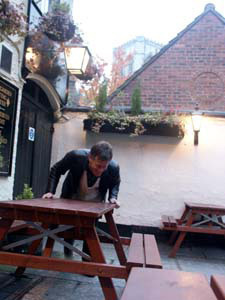 Their beer garden is where the horses were once stabled. They also serve a great bar menu. Holly highly recommends the cauliflower cheese bake which she says is akin to a bowl of fabulous melted cheddar cheese, as only the English can make it, with a cauliflower garnish thrown in so you can fool yourself into believing you’ve eaten something healthy. York has fabulous ancient streets to wander through after having a few pints. Also in York you will find Ye Olde Starr Inn. I believe this place dates from the 1400’s. It’s set back off of Stonegate in a little alleyway or snickleway. We’ve been several times and it’s always noisy and crowded and everyone always seems to be having a great time here. 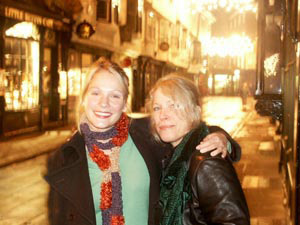 I had a great pub dinner with my Mom on a trip to York at the Old White Swan. We had delicious roast chicken and baked potatoes in front of a roaring fire. 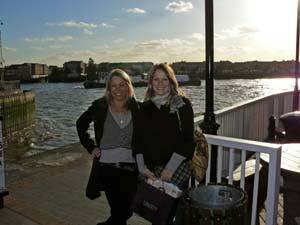 Windsor is an easy day trip from London and its cobbled streets have many quaint restaurants, tea rooms and pubs. 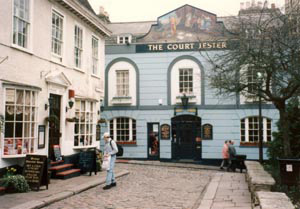 One pub we've enjoyed is The Court Jester, which is called something else now and was yellow instead of blue the last time we saw it. It sits at the end of a street facing Windsor Castle. 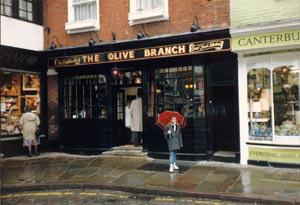 One of the first pubs we ever visited was The Olive Branch in Canterbury . 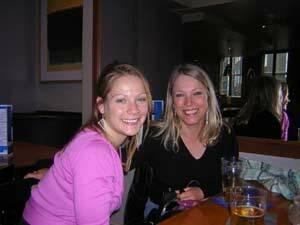 Holly was so young at the time, only 10, we were banished to the back “family room” for lunch. Great apple crumble. 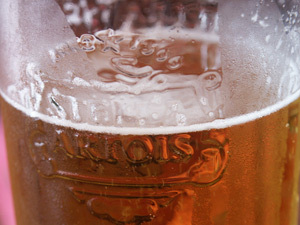 We were still getting used to the idea of tepid beer at this point in time. 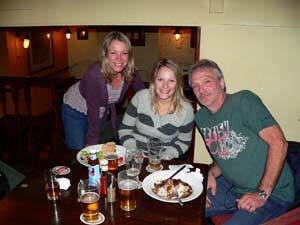 A great pub to visit in Dorset is The Banke Arms in Corfe. 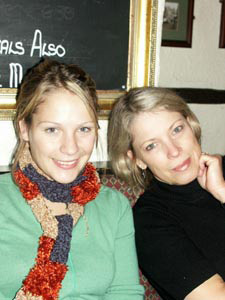 We visited Corfe in 2001 on what must have been the coldest, windiest day of the year. We were warmly welcomed into a snug little pub with a blazing wood fire in front of which a lazy black cat dozed. 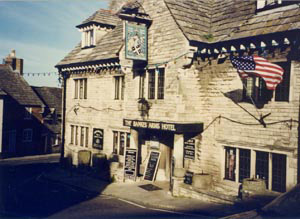 This was just a few weeks after 9/11, and we were very surprised, touched and delighted to see this pub flying a huge American flag to show support. 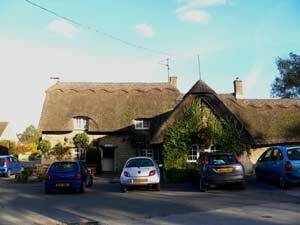 We enjoyed a delicious lunch and a nice respite from the freezing wind before our laborious climb to Corfe Castle which sits high atop a hill across from this pub. Definitely a place I’d like to revisit someday. 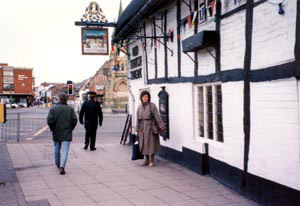 At the Rose and Crown in St. Albans , we had a quick lunch in the “snug”, which is a tiny little room once used by ladies, who were not allowed in the main areas of most pubs. 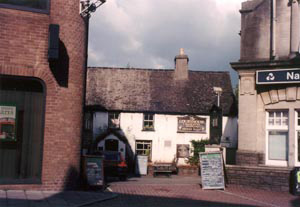 They serve good American style sandwiches as well as traditional pub food. The Verulanium Museum is just up the road and has wonderful reconstructed Roman pavements. Unfortunately we neglected to take a photo! 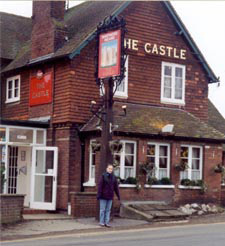 The Castle Pub in Bodiam , Sussex is another favorite. 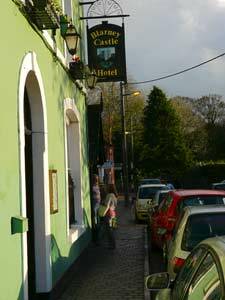 Very friendly bar staff, good food (including what was probably one of the best ploughman’s lunches ever), and to top it off, one of the most beautiful castles in all the world is just across the road. The day we visited, the castle was shrouded in a mist making it look like a fairytale castle. 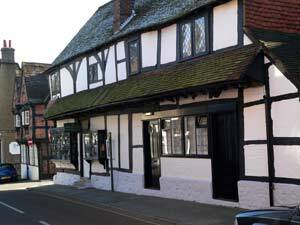 The Henry VIII pub in Hever is just across the road from Hever Castle and has been there almost as long as the castle itself. You must be very very careful indeed when leaving this pub - particularly after a few pints – as the front door opens literally onto the road itself - not so much as an extra foot of space between the door and the road. And it’s on a curve in the road at that. 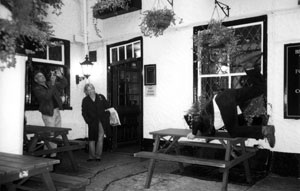 We actually inquired as to how many people had been killed leaving the pub over the years. We were laughingly informed that everyone locally was aware of the danger and took care. I hope most tourists are as careful! If you visit Caerphilly in Wales , be sure to make a stop at The Courthouse, which is right across the river from the castle. In fact, their back beer garden has what is probably the best view of the castle in the entire town. Probably one of the nicest pubs we’ve ever visited is the Cumberland in Doncaster . 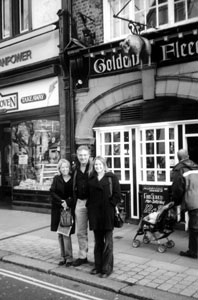 We were taken to The Cumberland to lunch by our friend, Paul, who lives in Doncaster. Definitely the classier type of pub. When visiting North Wales , a great place for a lunch/pint is Ye Old Mail Coach on Conwy’s High Street. Friendly people and if you are very very lucky, your pint glass just might make a perfect wet happy face on the table, as Allan’s did! 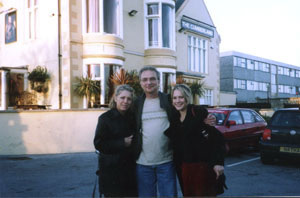 Now, the best Macaroni and Cheese I’ve ever had, bar none, was at The Swan Hotel and Pub in Arundel on our last trip. AND they have Stella Artois on tap. A winning combination in my book. 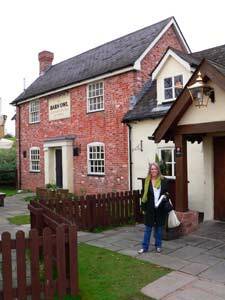 On a trip with my Mom, we took a respite from shopping and rested our aching feet at The Old Thatch Tavern in Stratford-Upon-Avon . 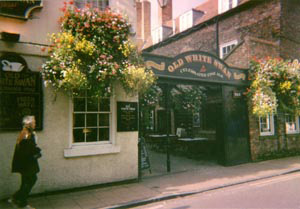 A very atmospheric pub that was surely contemporary with Shakespeare, and just around the corner from his home. It really does have a thatched roof, and claims to be the second-oldest pub in Stratford. Met a very strange character in this one. In Cardiff we were surprised to find Gretzky’s Bar (as in Wayne ) connected with the Wales National Ice Rink. 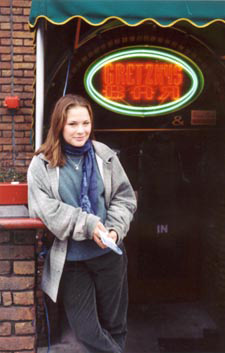 Unfortunately, Holly was only 17 at the time, so we missed having a pint on that trip.